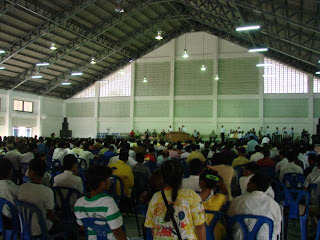 The Thai Conference this year had well over seven hundred in attendance. Twenty-nine people were baptized in Jesus' name and one hundred and ninety-seven people stood on the platform after Sunday's Holy Ghost service to be counted as born again of the Spirit. One Thai man (who only understands the Thai language) cried out "Glory, Glory, Glory" as he was filled with the Holy Ghost. There were also many, many people healed during the conference. 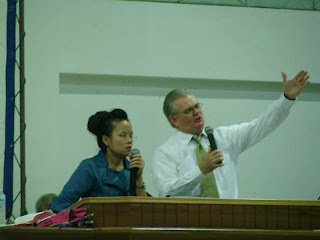 A twenty-one person team from the USA came once again to minister at the conference. Great teaching, preaching, praying and worship! 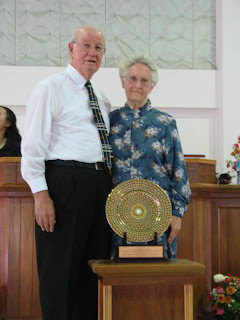 Brother & Sister Frank Poling were honored for their dedication and commitment in coming to Thailand and ministering for thirty years! After serving more than thirty-five years as General Superintendent of Thailand, Brother Chaiyong Wattanachant has retired. Brother Ping Ploklaa is the newly elected superintendent. "Thank you" so much for your continued prayers and support! 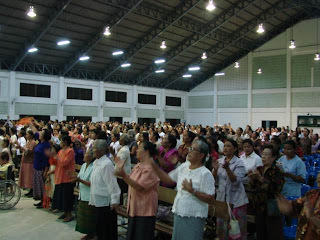 If you would like to support our ministry in Thailand on a monthly basis you can go to our web site and enroll as a "Partner in Missions" or you can give a one-time offering.